“Fracking is harmful to water supplies, wildlife, and property values. It has caused earthquakes where there were none. Since 2007, it began to tremble more and more near the wells. I can smell the foul emissions, which make me sick,” the founder of Local Environmental Action Demanded (L.E.A.D. ), a non-governmental organisation based in Oklahoma, told IPS. Hatley has property in Payne, Oklahoma, in the Midwest, which he says he cannot visit anymore because of the toxic emissions from the wells. 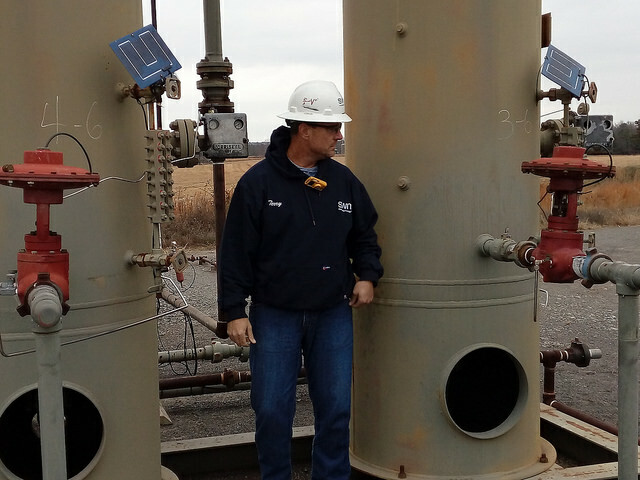 “The oil and and gas industry flares their escaping gas and also do not monitor leaks, as there are no regulations in Oklahoma demanding they do. We had the opportunity to test a few wells and found all of them were bad,” he said. In the state of Oklahoma there are about 50,000 active natural gas wells, of which some 4,000 use fracking. At least 200 of them are in Payne. With similar scenarios in other states, the anti-fracking movement in the US is especially worried about what President-elect Donald Trump will do after he takes office on Jan. 20, since he pledged to give a boost to the fossil fuel industry, despite its impact on global warming. The United States is the country that produces the largest quantities of shale oil and gas, which has made it the main global producer of fossil fuels, ranking first in gas extraction and third in oil. Trump “is sending signals of the support the industry will receive, which will exacerbate the already-known impacts of fracking, such as water pollution and methane emissions,” Argentine activist Daniel Taillant, head of the non-governmental Center for Human Rights and Environment (CHRE), told IPS during a workshop on fracking in the Americas, held in Little Rock, the capital of the southern state of Arkansas. 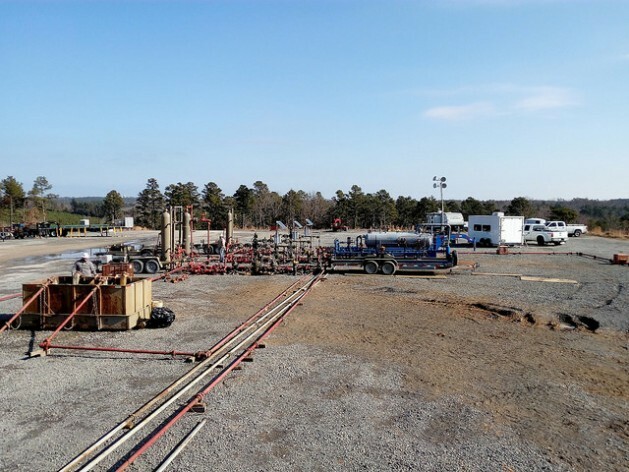 Natural gas trapped in underground shale rock is released by the process of drilling and injecting fluid into the ground at high pressure, which fractures the rocks. Fracking requires large amounts of water and chemical additives, some of which are toxic. Drilling and horizontal fracking generate enormous quantities of waste fluid. The waste liquid contains dissolved chemicals and other pollutants that need to be treated for recycling, and methane emissions, which pollutes more than carbon dioxide, the main culprit in global warming. Numerous studies have confirmed the damage fracking causes to water, air and the landscape, and how it triggers seismic activity. For the fracking industry, good times will return when Trump is sworn in. In May he launched a plan for the first 100 days of his administration, which included giving a strong boost to the sector, despite the denounced environmental, social and economic impacts. The programme includes the removal of all barriers to energy production, including fossil fuels, natural gas, oil and “clean coal”, valued in the document at 50 trillion dollars, in what it calls an “energy revolution” destined to produce “vast new wealth”. In addition, the president-elect promised to eliminate existing regulatory barriers on fossil fuels and promote the development of “vital energy infrastructure projects,” such as oil and gas pipelines. Data from the US Energy Information Administration (EIA) show that, of the daily US production of over nine million barrels of gas and oil equivalent, 51 per cent were extracted in 2015 by fracking, in spite of the collapse in international prices this year. The cost of extracting a barrel of oil by fracking is at least 65 dollars. Apart from Trump’s promises, the gradual rise in prices as a consequence of the reduction in production by the Organisation of Petroleum Exporting Countries (OPEC) since January, has encouraged the sector to continue to extract. The growing use of fracking has sparked lawsuits over its effects and scientific research to determine the impacts. The fourth edition of the “Compendium of Scientific, Medical, and Media Findings Demonstrating Risks and Harms of Fracking (Unconventional Gas and Oil Extraction)” lists 685 scientific studies published between 2009-2015 that prove water pollution, polluting emissions released into the atmosphere and their impacts on human health. The compendium, drafted by the Concerned Health Professionals of New York and Physicians for Social Responsibility (PSR), cites more than 900 studies in the US on the impact of fracking, which demonstrate the concern generated by the use of this technology. Meanwhile, people affected by fracking have filed more than 100 lawsuits since 2011, according to a count carried out by Blake Watson with the School of Law of the private University of Dayton, Ohio. In the specific case of Arkansas, a state where fewer people have been affected because the gas fields are located in sparsely populated areas, five cases have been settled out of court, three are still in progress and 10 have been thrown out of court. Fracking has also sparked local reactions. The states of Vermont and New York have banned the use of this technology, while in California six counties have followed suit, and in Florida 32 counties and 48 cities. Meanwhile, the state of Maryland has imposed a two-and-a-half-year moratorium, while Colorado’s Supreme Court ruled in May to lift the bans applied by two cities, and Texas passed a law making local bans on fracking illegal. “Opposition to fracking has grown in recent years, because there is more knowledge and evidence about the effects. Besides, the organisations have become more sophisticated in their analyses and more active,” said Andrew Grinberg, National Campaigns – Special Projects manager for the non-governmental Clean Water Action. For economic reasons, coal has lost ground to gas. In addition to the expansion of solar and wind energy, the resurrection promised by Trump faces a complex panorama. “Resistance against fracking is growing, especially in places where it is not yet widely practiced, because there is more knowledge about the harm it causes and that knowledge will increase. But the results of Trump’s support remain to be seen,” said Taillant, whose organisation operates in the state of Florida. In Oklahoma, 1,900 earthquakes have been documented since 2015, blamed on the injection of fluid byproducts from drilling operations into deep underground wells. Grinberg told IPS there are still pending issues in relation to regulation, such as the need for more public information on the chemicals used, and for a ban on basins for disposal of liquid waste, gas storage and methane emissions, a gas much more polluting than carbon dioxide.